Let me see now. 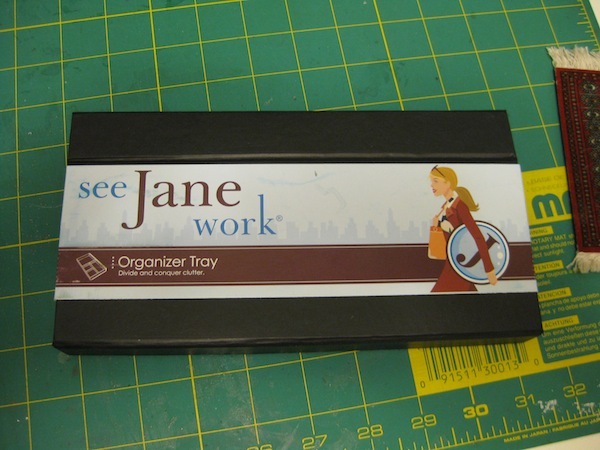 Spring of 2010 I think is when I purchased a few of these desk organizers. 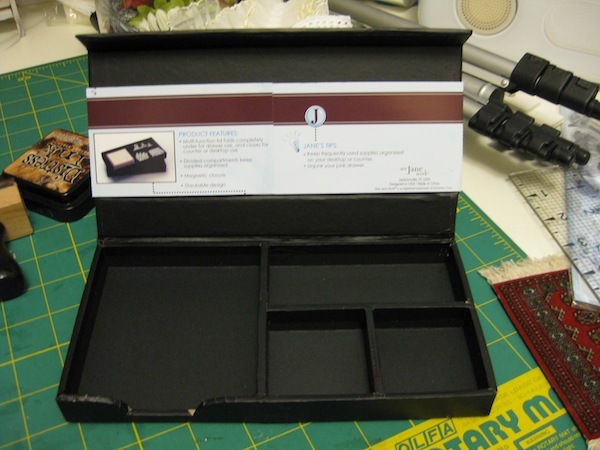 The lid has a magnetic closure. While at an Office Depot in Baltimore, Maryland I spied these in the clearance bin for $1.00 each and I snapped four of them up. They have been in a closet ever since. 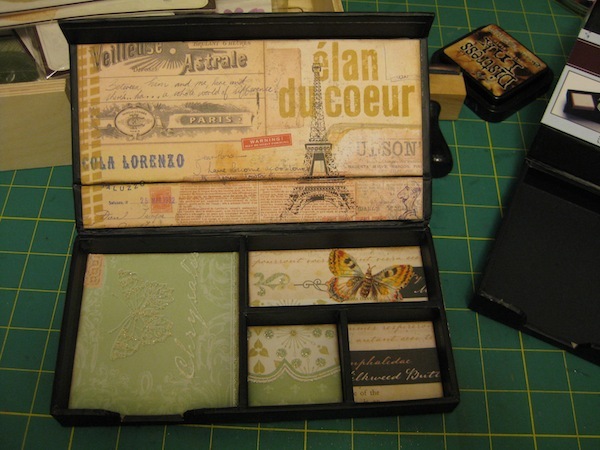 Inside the box are small compartments for post-it-notes, paperclips, and other small items. 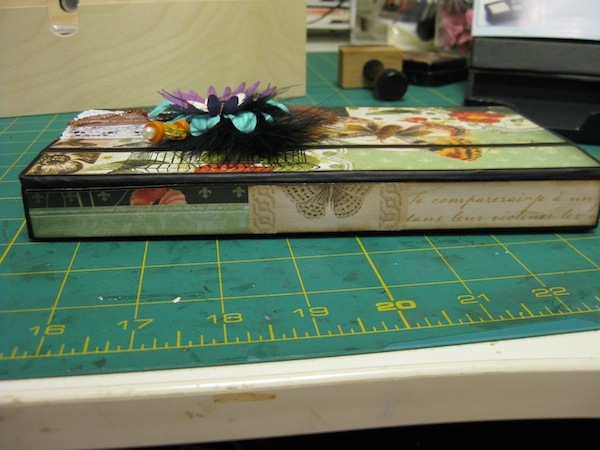 I’m using only two papers in altering this box. DCWV Mariposa and 7 Gypsies “Lillie” 8″ x 8″ paper. 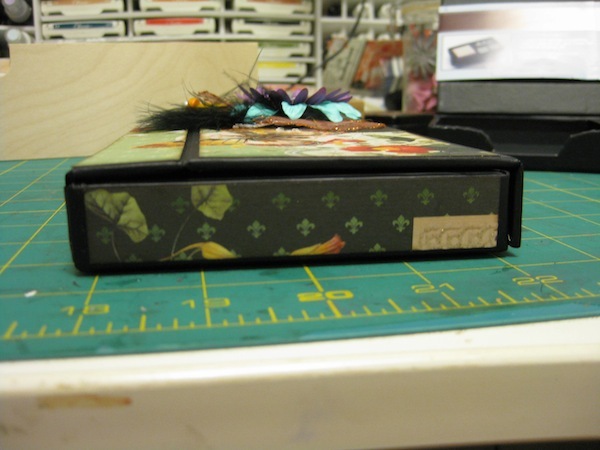 The box measures 8-1/2″ wide, 4″ deep, and 1″ tall. 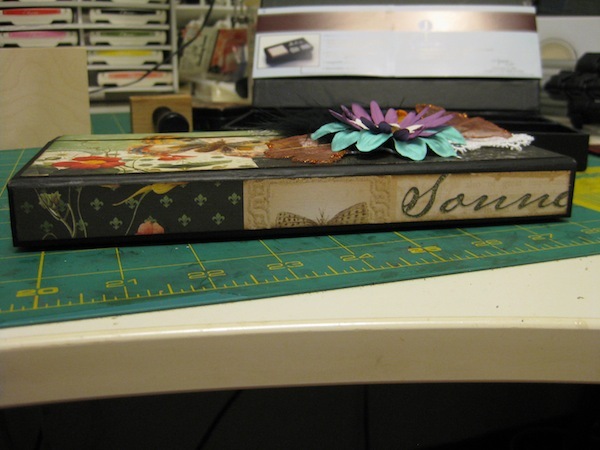 I’ve attached strips of Mariposa paper to the front, sides, and back of the box. 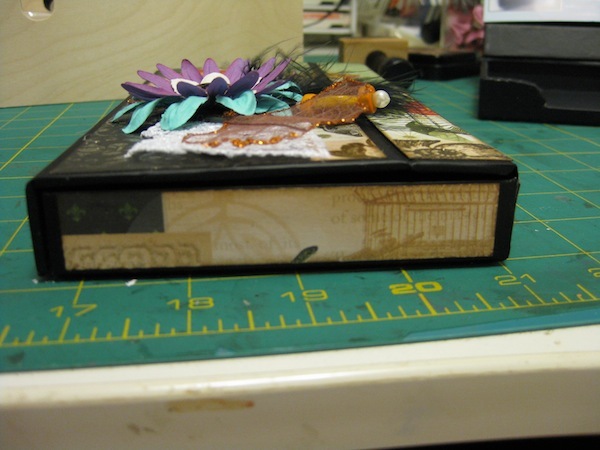 The lid of the inside of the box is covered with 7 Gypsies “Lillie” paper and the inside compartments are lined with Mariposa paper. 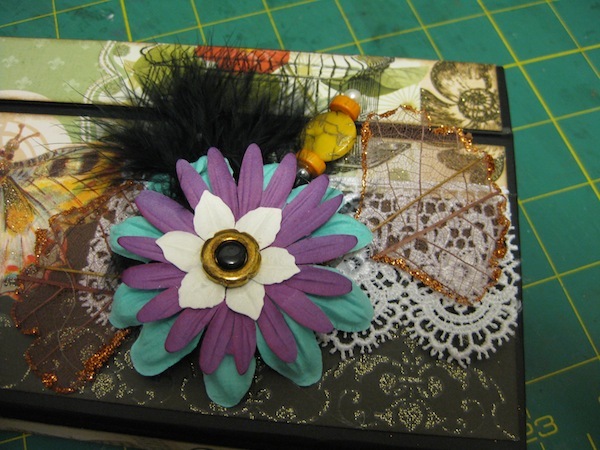 Glitter AND flowers all at once. For those of you that don’t know me, I have a difficult time with flowers. Have no idea why, just some kind of crazy anxiety. Won’t look right, others do better, not the right colors. You know, just a regular fear. Same with glitter. My husband is back in the hospital with a pretty big problem with his blood levels with the Coumadin (Warfarin). His INR is supposed to be 2.1 to 2.3. It has elevated to 9.6 and that is not good. So I will be with him until he gets back home. Tina, thank you for your prayers and support for Joe and I. I appreciate you very much. 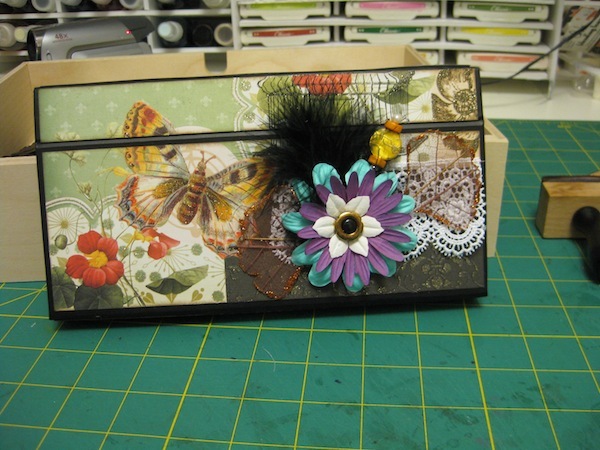 Thanks for the sweet comment on the desk organizer I altered. I finally got your blog to show up on my iPhone so I can keep track of what you are doing 😀 Exciting stuff you have going on there. Man, when Joe decides to get sick he makes it a whopper! At least he is back on the mend and going in the right direction, thankfully! I have to go tomorrow though as it will be too awkward for Jill to pick me up Friday. That sounds like an excellent plan. Both grandmothers get to spend time with the boys without the parents. Spoil them without the parents butting in 😀 I’m sure the boys will be delighted to have you in their home for a few days and will miss you when they go to the other grandparents, as you will miss them. Hope Jill and her husband enjoy their time in Dubai and all his hard work will pay off for him. The two of them can have a mini honeymoon 😀 Probably something they need after all the time they spend working and having a family. The adults get left out of stuff so it is really good for them to have this time alone. The thing about glitter, is there can never be too much glitter. And it’s going to get everywhere regardless, so it’s best not to try and control it, but more of a “guide it” type thing. I love glitter. I smack it on everything.